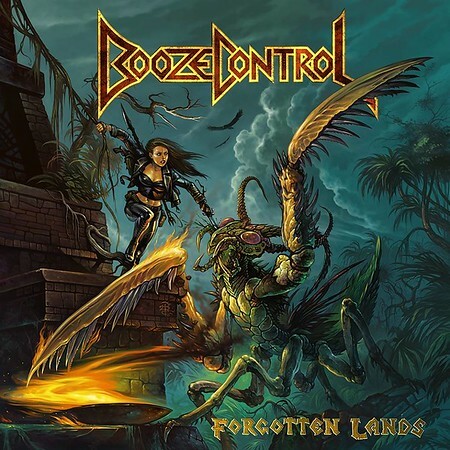 German metal band Booze Control released their fourth album “Forgotten Lands” on 22nd February. This is their first album with Gates of Hell Records. The band formed in 2009 and all four founding members remain in the band, although their sound has evolved over time. I included the album’s title track on the Friday NI Rocks Show on 22nd February. Booze Control formed in Braunschweig in 2009, initially as a trio featuring vocalist and guitarist David Kuri, bass player Stephen Kurth and drummer Lauritz Jilge. They were joined by guitarist Jendrik Seiler before releasing an EP called “Wanted” later that year. Their debut album “Don’t Touch While Running” was released in 2011. The band then apparently made a conscious decision to tighten up their song-writing and performance for the release of their second album “Heavy Metal” in 2013. They signed with Inferno Records for the release of “The Lizard Rider” in 2016, before signing with Gates of Hell Records for the latest album.